Electricity from water is a common phenomenon which most of us are well aware of but have you ever thought of generating electricity from wine? Well, Dr. Genevieve Bell has made this possible. Dr. Bell is an Australian born who is Intel’s in-house anthropologist. The new Intel chip that uses wine for power is the brain child of Dr. Bell. 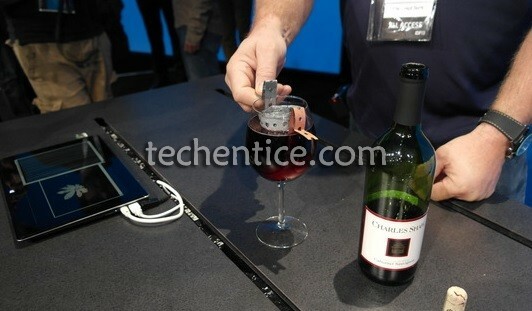 This Intel chip was unveiled at the Intel Developer Forum (IDF) in San Francisco recently when she demonstrated the processor powered by wine. In this process two electrodes are placed in the glass of red wine which reacts with the acetic acid in the wine to produce current. This current is enough to power the chip, a low powered processor. At the demonstration, as current was produced the microprocessor on a circuit board powered up. The low power microprocessor then ran a graphics program on a computer with an e-ink display. But low power does not signify low performance; Bell says that with this it would possible to start imagining a world of incredibly low power but also high performance as it is all about minimum power consumption with maximum computational output. This is what Intel sees in its future. This research came into existence while Dr. Bell and her team were looking into the problem of powering chips in mobiles which required minimal consumption so as to prolong its battery life and they came up with this idea. Though Intel is quite a long way off for its realisation in the commercial market it is producing chips like Bay Trail and Quark which is said to consume low power and thereby enhance battery life of mobile devices. The demonstration at IDF was Intel’s aim of showing how they were making progress in developing low power chips. However, Bell and her team’s next experimental ventures will be with a range of products such as embedded devices with sensors, smart watches and eye-wear.